The Superman Fan Podcast: Episode #301 Part II: Superman Family Comic Book Cover Dated May 1960: Superman's Girl Friend Lois Lane #17! Superman Fan Podcast is currently featuring the silver age of Superman stories found in Action Comics, Superman, Superman's Pal Jimmy Olsen, Superman's Girl Friend Lois Lane and World's Finest Comics. Episode #301 Part II: Superman Family Comic Book Cover Dated May 1960: Superman's Girl Friend Lois Lane #17! Superman's Girl Friend Lois Lane 17! Download Episode 301 Part II! SUPERMAN'S GIRL FRIEND LOIS LANE 17, May 1960, was published on March 24, 1960. It contained 32 pages for the cover price of a dime. Mort Weisinger was the editor, and the cover was pencilled by Curt Swan and inked by Stan Kaye. It featured the issue's second story. All three stories have been reprinted in SHOWCASE PRESENTS: SUPERMAN FAMILY VOL. IV. - THE GIRL THAT ALMOST MARRIED CLARK KENT (9 pgs. ), writer is unknown according to Mike's Amazing World Of DC Comics and comicbookdb.com, but the Grand Comic Book Database credits Robert Bernstein as the writer. All sources agree on the artist, the classic Lois Lane artist Kurt Schaffenberger. - LANA LANG, SUPERWOMAN (9 pgs. ), writer unknown according to Mike's Amazing World Of DC Comics, but Jerry Siegel was credited as the writer, according to the Grand Comic Book Database and comicbookdb.com. Because there is some discrepancy about the writer credit, I won't credit this story toward Jerry Siegel's total of silver age stories. This story was also reprinted in 80 PG. GIANT #3 (1964, published with the DC comic books cover dated September 1964, and had the cover price of a quarter. - HOW LOIS LANE GOT HER JOB (8 pgs. ), was written by Otto Binder and drawn by Kurt Schaffenberger. 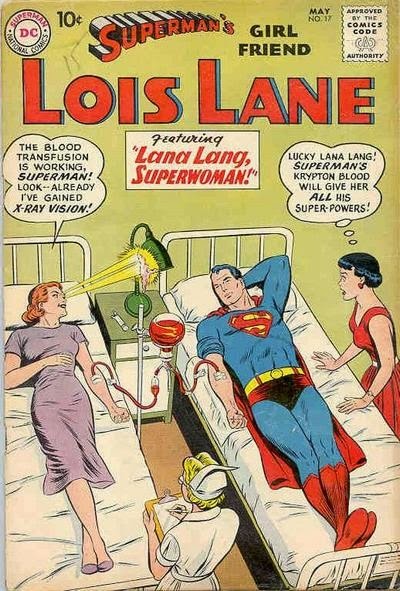 The subtitle for this story was THE FIRST UNTOLD STORY OF LOIS LANE. It has also been reprinted in SUPERMAN: DAILY PLANET. Also highlighted in this episode are the issue's ads and other features, including the LETTERS TO LOIS column. Elsewhere in DC Comics, 28 titles carried the May or May/June 1960 cover date, which were covered back in Episode 213, for the week of January 11, 2013. The next issues featured will be the Superman comic books cover dated April 1963. Part I will highlight SUPERMAN 160 and Part II will focus on ACTION COMICS 299! Then we will return to the Superman Family comic books cover dated June 1960: Part I featuring SUPERMAN'S PAL JIMMY OLSEN 45, and Part II: WORLD'S FINEST COMICS 110! The Superman Fan Podcast is now available on Stitcher, for your smart phone, tablet or computer. The new home for THE SUPERMAN FAN PODCAST is http://thesupermanfanpodcast.blogspot.com. Send e-mail to supermanfanpodcast@gmail.com. You can join the SUPERMAN FAN PODCAST group or page on facebook, and follow the podcast on twitter @supermanpodcast. - The SUPERMAN PODCAST NETWORK at http://supermanpodcastnetwork ! The theme of this podcast is PLANS IN MOTION, composed by Kevin MacLeod, and part of the royalty free music library at http://incompetech.com/. 2017 Superman Fan Podcast Promo! 2019 Superman Fan Podcast Promo!